The construction of the south grandstand for the Benito Villamarín Stadium in Sevilla, Spain, increased seating capacity by more than 14,000 seats, making it the stadium with the fourth-largest capacity in Spain. This new grandstand will house bleachers for designated fan groups, a Premium Area, with 435 normal seats and more comfortable stall seats, as well as direct access to three VIP rooms. ULMA designed special shoring and formwork solutions for structural elements of the grandstands: the gantry, intermediate beams, and cap beam. Both beams with complex geometry feature a base with two distinct curvature radii, larger in the centre and smaller at the ends of the grandstands. To avoid taking up the space required for shoring towers, ULMA proposed a solution based on heavy duty brackets, adequate for the relatively thin walls designed. 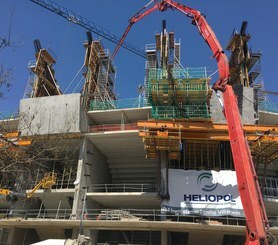 Once installed between two contiguous gateways, two 15 m profiles were placed to support the ENKOFORM beam formwork system. The formwork was divided into two 6 m modules to execute the distinct beam lengths yet move simultaneously. Moreover, they were designed so that they cover the base and exterior face of the beam along with the necessary working platforms. This solution and the auxiliary elements were designed so that the bracket could be placed and removed with a tower crane from inside the stadium, even though the edged girders were in place. The loads were transferred to the floor with T-500 Shoring Towers in the area where the pre-existing structure was joined to the new project, where it was impossible to use brackets. Heavy duty concrete shoring system mainly used for high-rise bridge or viaduct constructions. Highlights: modular system, easy transport, quick and safe on-site erection.